Crystal Clear Pickups Late 60's reproduction Mustang / Duo Sonic pickups. Our mustang pickups offer a full Strat like tone. Hand wound with 42 plain enamel wire. Alnico 5 magnets with flat poles. 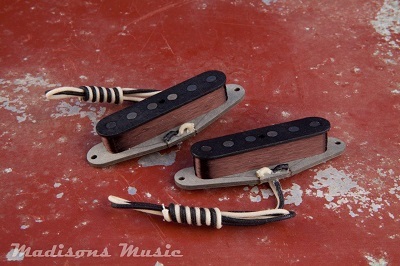 We wind these identical to our 60's Strat pickups. Our aged pickups can be aged to any level of distress. Our hands on experience with vintage instruments gives us the upper hand to reproduce authentic vintage tone.